Manila, Philippines - The Department of Education (DepEd) has officially released the school calendar for school year (SY) 2014-2015. Based on DepEd Order No. 18, series of 2014, the opening of classes shall be on Monday, June 2, 2014 and the last day shall be on Friday, March 27, 2015. 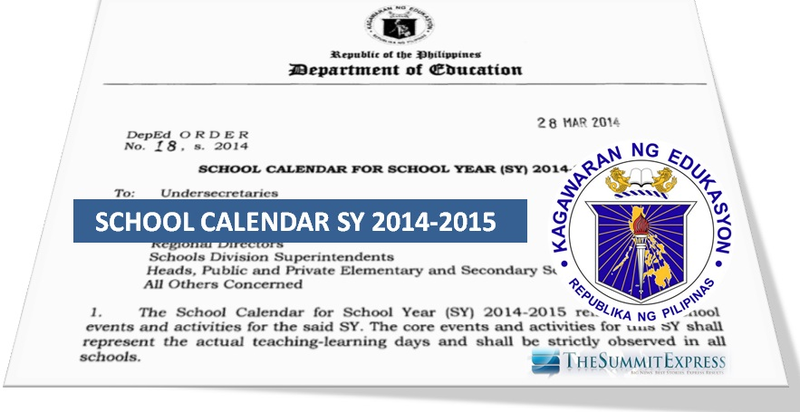 "The School Calendar for School Year (SY) 2014-2015 reflects the school events and activities for the said SY. The core events and activities shall represent the actual teaching-learning days and shall be strictly observed in all schools", DepEd has stated in the memo. Education Secretary Armin Luistro said, “SY will consist of 201 school days” inclusive of the five-day In-Service Training (INSET) break and the parent-teacher conferences. Also released in the said calendar are the different school events and activities—including the number of school days per quarter. “Private schools may deviate from this school calendar. However, they may not start classes earlier than the first Monday of June and not later than the last day of August. They should also notify the appropriate DepEd officials in advance regarding any deviation, “ the DepEd Order stated. It also stated that schools may observe national and local celebrations and holidays, provided that the total number of school days shall be maintained and make-up classes shall be conducted to compensate for the school days spent for the said activities. DepEd also said that Christmas break for SY 2014-2015 shall begin on Saturday, December 20, 2014. Classes shall resume on Monday, January 5, 2014. Meanwhile, the summer classes shall begin on Monday, April 13, 2015 and end on Saturday, May 23, 2015 which is the last day for the final examination. In preparation for the opening of classes for SY 2015-2016, the schools shall conduct the following activities: early registration on Saturday, January 24, 2015 and Brigada Eskwela from May 18-23, 2015. You may download above DepEd Order for reference and dissemination purposes. Like Us on Facebook or Follow Us on Twitter to receive more updates on DepEd announcements. You may Subscribe also to our RSS Feeds through E-Mail.